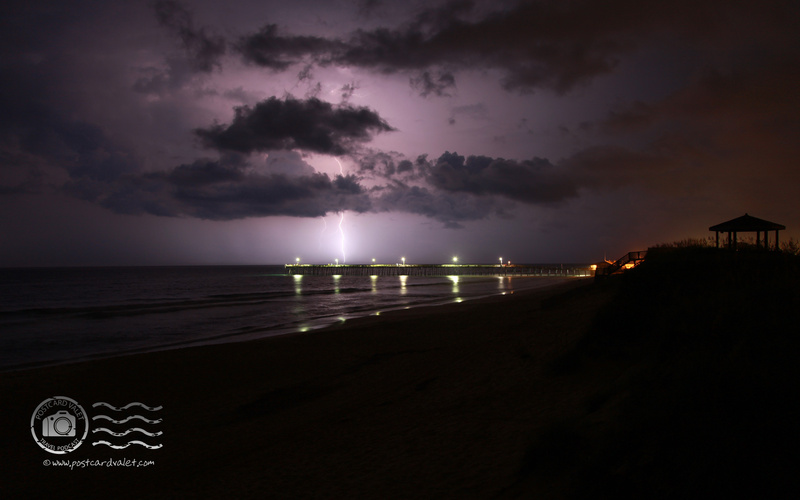 Nags Head is turning into my de facto lightning photography grounds. My grandparents have a beach house with a covered porch and hot summer afternoons often turn into evening thunderstorms. But conditions aren’t always right. Even when it’s not raining, often the wind blows so hard the camera vibrates on the tripod. 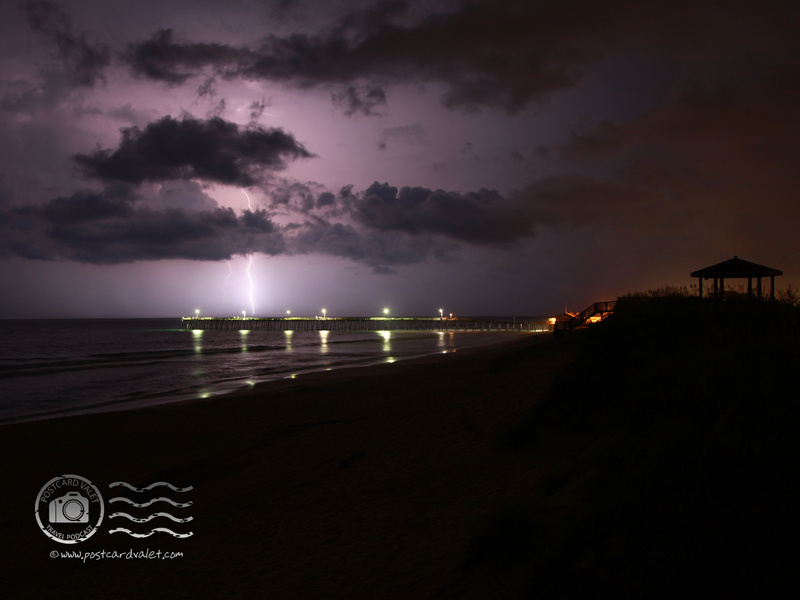 Anyone that’s tried to get a good lightning photo knows that it can take a lot of patience. Good thunderstorms may display nice strikes every few seconds, but that doesn’t mean you’ll always have your camera pointed in the right direction. Even if you do, the lightning strikes themselves won’t necessarily be photogenic. It once took me 57 tries to get a lightning bolt to cooperate with the rule of thirds. A couple weeks ago, another summer thunderstorm was passing us by at the cottage. My cousin had a new camera and was out on the front porch trying to get a lightning photo of her own, but I decided to stay inside because it looked like it might rain at any minute. Eventually she packed up, but the rain never arrived. Later in the evening, when the lightning flashes picked up in frequency, I stepped out to take a look for myself. The storm was passing south of us, heading out to sea, and as the warm, inland air advanced out over the sea, bolts of lightning were dancing every which way. For a storm lover like me, it was a great show. Even better, from where we sat it, was warm, dry, and there was not a breath of wind. I decided to run in and grab my new camera. Our neighbor’s cottage was empty, boarded up for the season. I didn’t figure they’d mind if I commandeered their gazebo overlooking the ocean. Our porch is set back behind a dune, so it was a treat to be able to look out toward the Nags Head Pier with the storm behind it. I didn’t even need a tripod; there was an 8-foot supporting column with a nice, flat surface on top. How good was the show? It took me exactly four exposures to get this shot.